If you saw Dwyane Wade crying during the National Anthem before Sunday's Miami Heat and Charlotte Hornets winner-take-all Game 7 in south Florida, he took to Twitter Monday to explain why. So yesterday i wasn't crying like some may think but i just listened to an interview with Damaris Lewis calling up Prince..Prince!! Wade went on say that although he has fans all around the world, hearing the Prince was one of them "was an ultimate compliment." The Heat icon was obviously a fan of the Purple one, Tweeting out "He will forever live on. #RipPrince" on April 21st, the day Prince died. Wade was apparently referencing listening to a recent radio interview with the 57-year-old late legendary musician, in which Prince's girlfriend Damaris Lewis called and woke Prince up while on an Australian radio show. During the phone call, which occurred in 2012, Prince was asked if he has been watching basketball. "Oh, Absolutely," he responded. "Dwyane Wade is my favorite player but the Thunder are my favorite team." When pressed to reveal whom he would choose if it came down between the Heat in the east and the Thunder in the west, he slyly declined to answer. 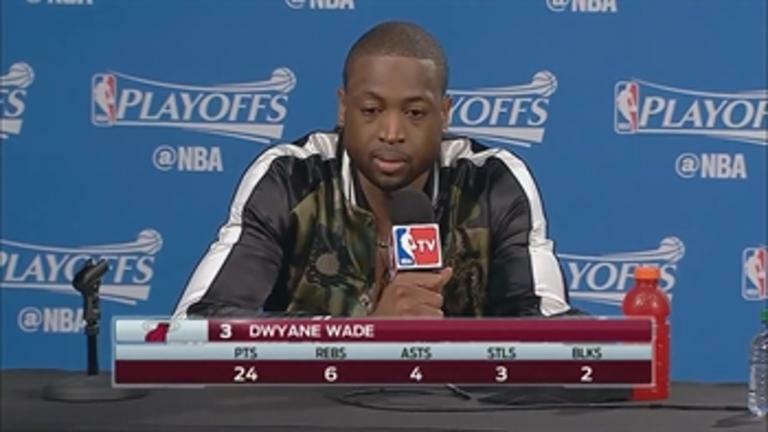 The emotions did not seem to affect Wade or Miami as the Heat cruised to a 103-76 drubbing of the Hornets, punching their ticket to a round 2 matchup against the Toronto Raptors.